Grow your own little piece of Australia with the native Kangaroo Paw Gift of Seeds. The furry, claw-like bright red flowers on long stems are absolutely stunning and are widely used as cut flowers. Kangaroo Paw is the state emblem of Western Australia and grows naturally in the South West of WA. A gift and a card in one, this Gift of Seeds is embellished with stunning illustrations created by Daniella Germain. 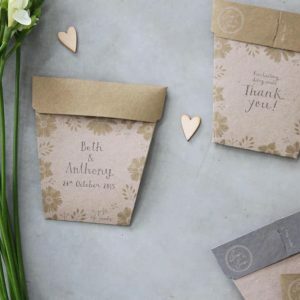 Each packet comes with a plastic plant label, seeds and sowing instructions. Anigozanthos flavidus Click here for more information on Kangaroo Paw seeds.